Young-Key Kim-Renaud, a professor emeritus of Korean language and culture and international affairs, hopes a Korean studies institute will deepen researchers' and students' understandings of Korea. A grant from the Academy of Korean Studies will fund the institute at GW. Updated: Sept. 26, 2016 at 2:59 p.m.
A new institute on Korea will launch at GW as early as this semester. A grant from the Academy of Korean Studies will fund the GW Institute for Korean Studies, which has not yet been formally announced and remains in planning stages. Faculty and officials say that an institute focused on Korea is a logical fit for the University, which already has longstanding ties with the country. The academy, a division of the Ministry of Education in the Republic of Korea, awarded faculty member Jisoo Kim a five-year grant of an unknown amount to establish the institute. Kim is a Korean Foundation associate professor of history, international affairs and East Asian languages and literatures and is on sabbatical this semester. She declined to comment, citing her sabbatical leave. The grant will fund conferences, workshops, lecture series, graduate fellowships, adjunct teaching, summer programs, Korean collection cataloging, staff support and outreach, according to the history department’s website. The Academy of Korean Studies is processing the paperwork for the grant, and the University must approve a charter for the institute for it to formally launch. The institute is a clear fit for GW, faculty said: The first Korean immigrant to the U.S. was an alumnus, more than 900 alumni live in South Korea and 286 students from South Korea are currently enrolled at the University, according to the institutional research office. And the institute offers a central home to existing Korean studies programs. Hope M. Harrison, the associate dean for research at the Elliott School of International Affairs, said in an email that officials plan to formally launch the institute later this fall. The institute will focus on interdisciplinary research and teaching from across the University, she said. Richard Grinker, the director of the Institute for African Studies and the acting director of the Korean institute, said the University will release more information about the Korean institute’s charter and finances next calendar year. “We know for sure three things: One, we know that we got the grant. Two, that we are going to ask the University to charter us as an institute. And that we have tremendous enthusiasm from outstanding faculty in fields like management, history, political science, economics, dance, art, language,” Grinker said. The grant proposal – a copy of which was obtained by The Hatchet – stated that although there are some other institutions in the greater D.C. area with expertise on Korea, “they are not focused on developing a dynamic undergraduate and graduate curriculum to train students and facilitate research in Korean language, culture and history,” like GW’s would. The institute will connect students with institutions in D.C. that conduct research on Korea, Grinker said. The University’s strategic plan calls for officials to create institutes like the one on Korean studies within the University. The Institute for African Studies, which is also housed in the Elliott School, was launched in July to create a more focused African studies curriculum and host an annual conference. The University also established the Loeb Institute in January, which focuses on religious freedom. Young-Key Kim-Renaud, an emeritus professor of Korean language and culture and international affairs, said in an email that she has noticed a growing interest in Korean studies and the Korean language. She said she hopes the institute will deepen students’ and professors’ understanding of the country. Celeste Arrington, a Korea Foundation assistant professor of political science and international affairs, said in an email that GW now has more faculty conducting research related to Korea than virtually any other American university. The Sigur Center for Asian Studies in the Elliott School offers degrees in Asian studies, but the new institute’s programs will focus more closely on Korea and expand on the existing minor in Korean language and literature in the Columbian College of Arts and Sciences to a major, Arrington said. “Students might be especially interested to hear that we will be developing a robust Korean Studies curriculum by creating a Korean academic major program and offering new courses, summer study abroad program and internships,” Arrington said. The institute should also allow GW to offer more Korean studies courses and opportunities for students to travel to Korea, faculty said. Other programs within the University have helped students travel to and find jobs in Korea. Last spring, the business school formed the Korean Management Institute to connect students with South Korean executives, create new research portfolios and work with alumni in the region. In 2010, GW received a $1 million donation to fund a U.S.-Korean student exchange program for students in the School of Engineering and Applied Sciences who wanted to study abroad at Korea University. 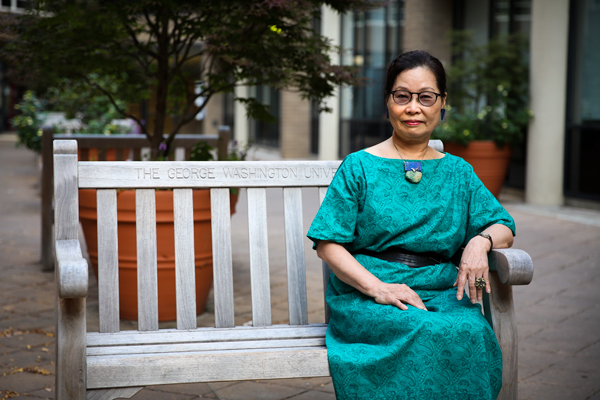 Miok Pak, a teaching assistant professor in the department of East Asian languages and literatures, said in an email that the institute will make GW the “hub” of Korean studies in the nation’s capital, surrounded by other places that have expertise on Korea, like the Korean Economic Institute. Doug Shaw, the senior associate provost for international strategy, said in February that GW should focus on partnering with D.C.-based international organizations to keep costs low while expanding international outreach. Pak said the institute will allow students to work with experts outside the University. “The University will be able to expand the Korean studies at GW by bridging humanities with other fields of science, engineering and business, among others, not only outside the University but also within, among different schools at GW,” Pak said. The Hatchet incorrectly reported that Jisoo Kim is an assistant professor. She is an associate professor. We regret this error.